I'm in the very early stage of brainstorming for design concepts of the Android.SE's official theme. I want to pitch some of my ideas to the community before I start t designing. Overall look and feel: modern, clean and minimalist. The site should feel similar to the user interface elements found in most Android phones. Use the Android robot as favicon or part of the header image, since we're allowed to use it legally. Typography: I'd like to use Droid Sans as the header and body text(via @font-face). However I need to make sure the font renders smoothly at a smaller size on Windows. Please let me know what you think. Also feel free to post your own ideas. One thing I need to stress is that I'd like to focus on ONE overall look and feel. For now I feel the modern and slick one works well, since it represents Android UI. Feel free to disagree, but explain your argument. What should the tag and badge treatment be? What should be used for the 404/error/captcha page images? I'm thinking about using the Android Robot for these, to keep a whimsical theme. What are some of the Android related sites out there that you like(design wise). I've looked at quite a few, but haven't found any that stands out for me. Keep in mind, while I want the our site to look "Android-ish," but it's also important to give this community a distinct identity. The 404/error/captcha pages should feature Androidify versions of Jeff, Joel and the rest of the crew. I personally don't mind the Android Web Market colour scheme and look. It's a very minimalistic design that incorporates all of Androids colours (except for orange). I think the logo should definitely have the Android in it. obviously we'd have more horizontal space to work with, but stretched it would fit the stack aesthetic pretty well. The little bumper at the bottom would be a fun trick to play around with if we were going to have a page/comment load transition. I much prefer a sans font, so I think that's a good choice. As for badges/tags, it'd by nice if they were similar to the standard buttons. A smaller version of with text might serve for badges. Change the color in the center for bronze/silver/gold. The buttons here are definitely viable for both. They gray/silver could be for normal tags, the yellow for featured tags. How about this? It's actually an arm from the Android mascot. Perhaps not as in-your-face green, but the radius of the curve evokes Android. Other places you might look to for inspiration: There is an Android Gmail theme, a Chrome theme as well as several themes for iGoogle (though these last are unofficial). None of the Android blogs I read have designs that really "inspire". AndroidTapp looks the best (I think) but is not overtly "androidy". 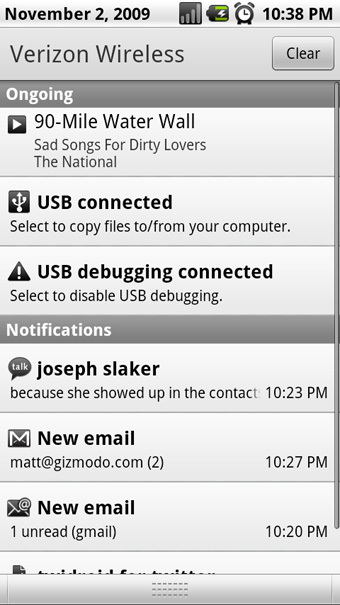 I like the look and feel of AndroidandMe.com.